This was truly one of the easiest costumes I’ve ever put together (and it’s also one of my favorites since Rosebud the Kitten is involved.) When brainstorming ideas for duo costumes I was thinking about famously cool couples in history. I kept going back to Martin and Osa Johnson, the explorers and documentary filmmakers who spent the first half of the 20th century traveling to faraway lands and documenting their adventures. 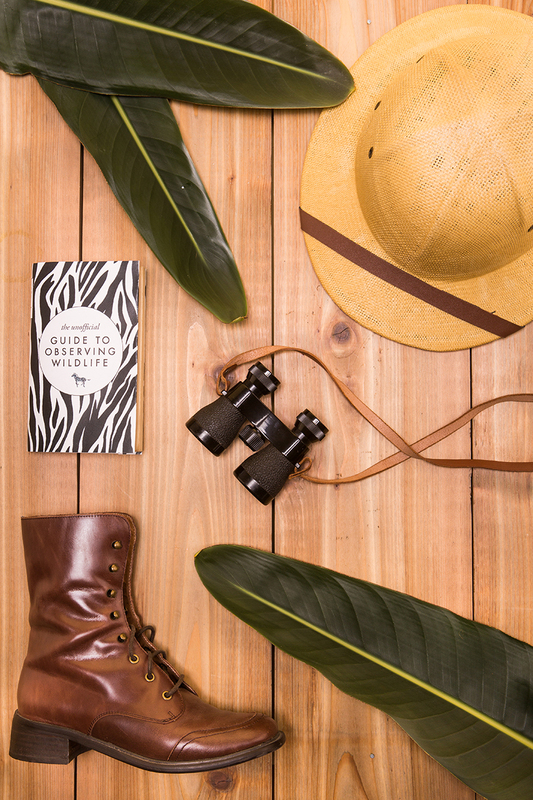 Regular old safari gear seemed easy enough, but Martin and Osa were known for being particularly put together when they traveled. 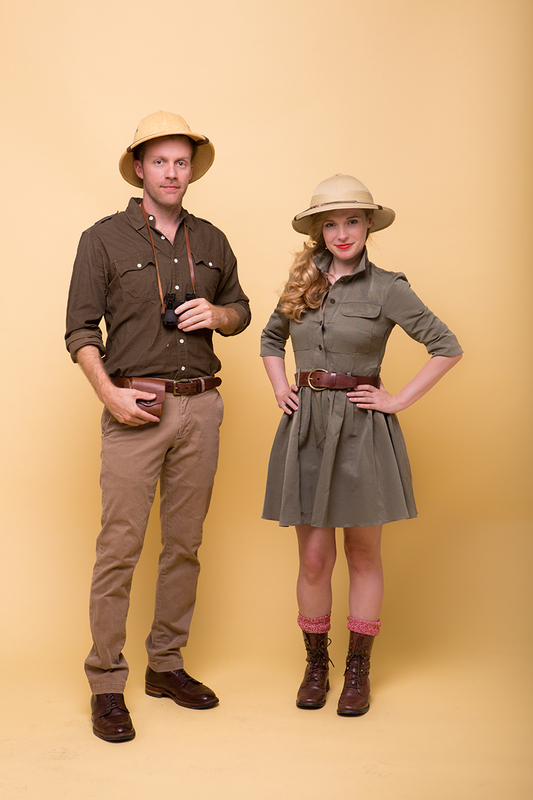 That gave me a great excuse to start hunting for some fun high-style safari pieces! I found my safari dress on ASOS (the military belted skater dress) and I already had my Jeffrey Campbell combat boots. I wore those with a pair of marled socks for a retro look. The two safari hats I found on eBay, and I made sure they didn’t exactly match for a more authentic feel. Michael already had a pair of khaki chinos and a brownish olive button down shirt. Etsy has an incredible selection of retro binoculars listed, and I was able to pick up a set for around $30. The book jacket I designed after Osa Johnson’s classic I Married Adventure zebra-striped book cover. The book jacket fits a 7-inch tall book (or more specifically, my paperback edition of The Hobbit.) You can download our custom book jacket here! The ultimate accessory to this couples costumes is definitely the cat. Our kitten, Rosebud, has interesting stripes and circle patterns on her fur — we’ve always thought she might have a little bengal cat in her blood. I’m pretty convinced that she looks like a baby tiger in these photos, but that might just be parental bias. In any case, this is a perfect costume for couples who want to show off an exotic looking pet! Click here to check out more of our Couple’s Halloween Costume Ideas! 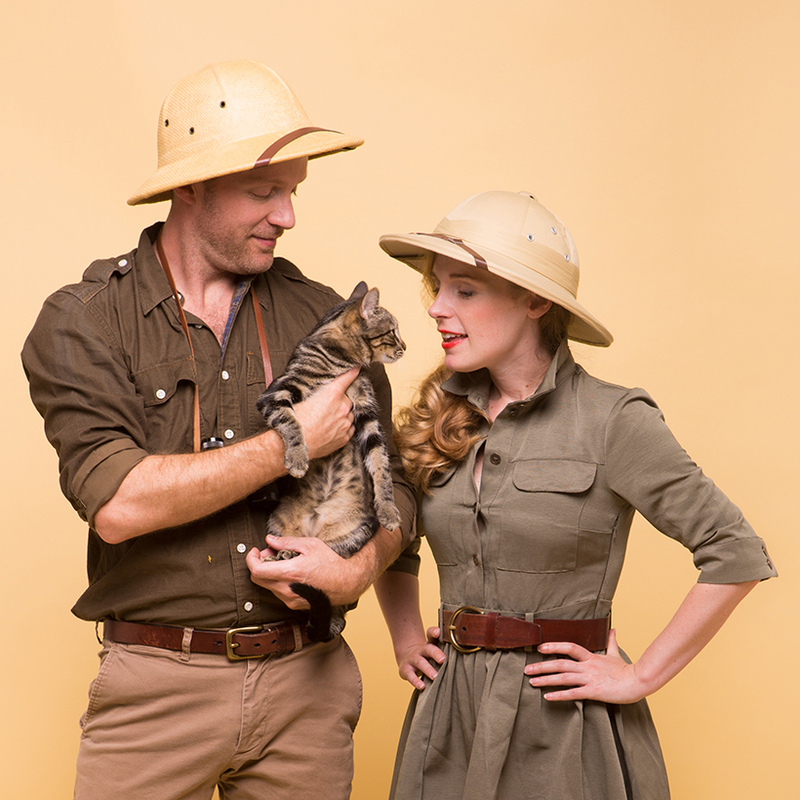 Thank you for using Martin and Osa Johnson as inspiration for your fantastic safari costumes. And your book cover is a wonderful tribute to Osa’s autobiography I Married Adventure. Well done! Thank you so much, Conrad. 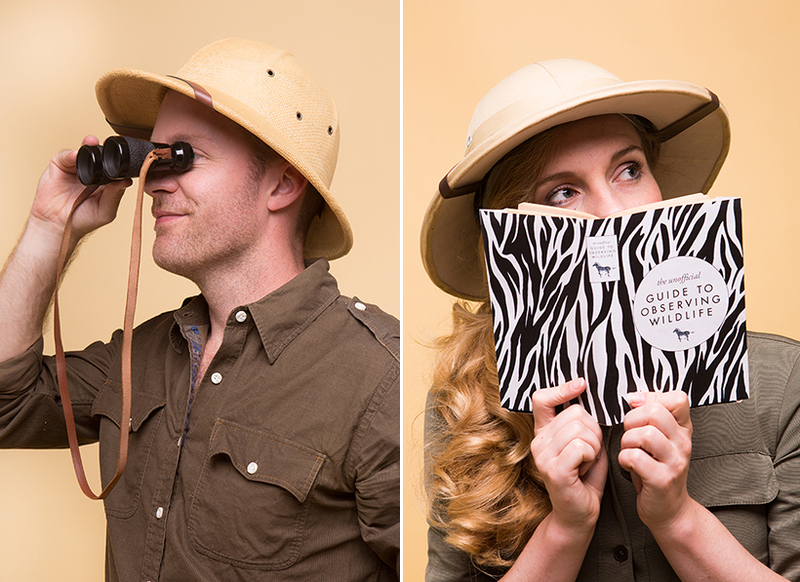 I just checked out the Martin and Osa Johnson Safari Museum online and it looks incredible. We may have to plan a trip to Kansas to check it out in person. Happy Halloween! Jennifer, You’re certainly welcome to visit anytime! If you want to read the museum’s quarterly newsletter, Wait-A-Bit News, send your email address and we’ll get those to you. Have a fabulous Halloween! where was your husband’s shirt from?